Starting out with the best shared WordPress hosting provider can look daunting. For this reason, we have sorted some of the top solution available for WP-based projects that stand out from other offers and deliver a bunch of essential web building instruments out of the box. It’s high time we highlighted all benefits and instruments delivered by top WordPress shared hosting providers. But first, you need to memorize some of the crucial aspects when choosing hosting. BlueHost is more WP-oriented hosting provider. It comes as a flexible instrument not only to host your WordPress project but also to build a website from scratch. Multiple plans, affordable prices, and endless optimization instruments will let you come up with a solid WP-based site. SiteGround is a more expensive hosting solution though with some obvious advantages. They include comprehensive security means to ensure exceptional website running and high performance. The WP managed hosting looks like a reliable platform. Hostinger is the cheapest server solution for WordPress sites. At the same time, it offers WP-optimized plans, fast installation WordPress installation (automated or manual), great uptime, and page load speed. Hostinger can be a good solution for customers with limited budgets. Page Load Time – The issue that defines the level of users experience. The faster visitors can access your website content the better. Uptime Rate – Availability is the key to success. The uptime rate defines whether your visitors can access the website around the clock. Make sure the rate is between 99.5% and 99.9%. Customer Support – Some possible errors will occur from time to time. Make sure you can always count on professional assistance to resolve any issue fast. Now, let us have a closer look at what best WordPress shared hosting providers can offer. User-Friendly Control Panel – Bluehost makes it easy to handle the WordPress website building process thanks to its intuitive cPanel. Here you have all the necessary elements in one place to manage several projects at the same time. WordPress geeks will appreciate the opportunity to transform it into a WP dashboard and benefit from an interface they are used to. 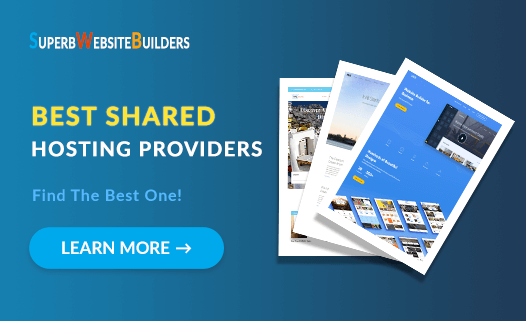 Endless Widgets and Plugins – While being a WP-specialized hosting platform, Bluehost delivers thousands of widgets and apps for WordPress websites. They are available at the Bluehost Marketplace as well as WP themes both free and paid. eCommerce and SEO – The platform offers localized SEO strategies and professional assistance, while eCommerce feature makes it easy to launch a digital store with as many products as you need in addition to SSL certificate, shopping cart integration, etc. Enhanced Customer Support – Apart from traditional ways to keep in touch with the support team, Bluehost has a pool of experts to lend a hand whenever you need to integrate analytic tools, install a new plugin or boost SEO ranks. Bluehost Shared Hosting Cost: The platform offers three major plans for shared hosting. They include Basic Plan ($2.95/month), Plus Plan ($5.45/month), and Choice Plan ($5.45/month). The Basic Plan comes with unlimited bandwidth, WP updates, 50GB of storage, free SSL certificate and free domain name. Looks like a good value for money though an upgrade to advanced plans will hardly be a tough challenge for the wallet. WP Managed Hosting – From now, you do not have to worry about all the installed plugins for your WordPress website. The system will take care of them ensuring prompt updates, smooth running, digital security, etc. SiteGround uses mainly its own house-crafted cashing tools to ensure fast page loading. Simple eCommerce – Do you need to create a great eCommerce website? Forget about installing dozens of different plugins and apps. The system offers 18 basic applications in one. Simply choose the applications you might need to power your digital store and start building the website. Enhanced Security – Unlike other hosting providers offering some baseline security tools, Sitegorund has an advanced tracking technology that enables your website monitoring every 0.5 seconds to keep it away from any threat. In addition, users will appreciate more instruments like IP blocklists, hotlink protection, and more. SiteGround Shared Hosting Cost: although SiteGround does not have a free trial, you can claim for the money back within first 30 days. As for the available plans, they include three major packages. StartUp Plan costs $3.95/month and delivers 10GB of storage space in addition to essential features. GrowBig Plan costs $6.45 per month and includes advanced features. With GoGeek Plan costing $11.95 per month, you get all the features from the previous two plans in addition to premium tools. Automated WP Installer – You can switch to the WP dashboard once you have entered Hostinger account. The system offers several options from the start with an automated WP installer. Users can handle the installation process manually as well. Simply add the website’s URL and name, while the WP installer will download the latest WP version and adapt it to your server environment. Hosting Plans Designed for WordPress – Customers can choose from several basic plans at an affordable price. Moreover, the platform has some specially designed WordPress plans with some specific hosting options. The price is the same, but the WP plans are optimized for the world’s most popular CMS. Great Performance – Hostinger has proved to be a reliable server solution with high uptime rates and page load speed. As for the uptime, the average rate is 99.98%. which is very close to the industry leaders. As for the page load speed, the latest results were 315ms. Hostinger Shared Hosting Cost: If you have a limited budget, the basic plan with a single shared server can be a good option costing only $0.82. For this price, you will get 100GB bandwidth for a single website. Are you craving for extended web server capabilities? Premium Plan will cost you from $2.15 per month featuring unlimited bandwidth and websites. Weekly backups are included in the plan. Business comes as an all-in-one server solution with unlimited features for only $3.45 per month. Deciding on the best hosting solution depends on future projects features, purposes, and goals. The idea is to choose a platform with enough instruments and capacity to host your website and ensure its flawless performance. The above-mentioned platforms can be a good solution for various types of projects. It does not matter what hosting provider you choose. Make sure it has everything you need with enough bandwidth, storage space, and extra tools to have an all-in-one package for the future project.